Nowadays everyone loves to send and receive online birthday greetings, and they all appreciate getting something special for their Happy Birthday. So making a birthday slideshow video will be a good way to show that you truly care about him/her and do not settle for an off-the-shelf product. Making funny birthday video slideshows is not difficult if you have the right birthday photos and happy birthday quotes and sayings. You may get photos from his friend and family, it would be a good idea if you collect all his photos on every significant stage. 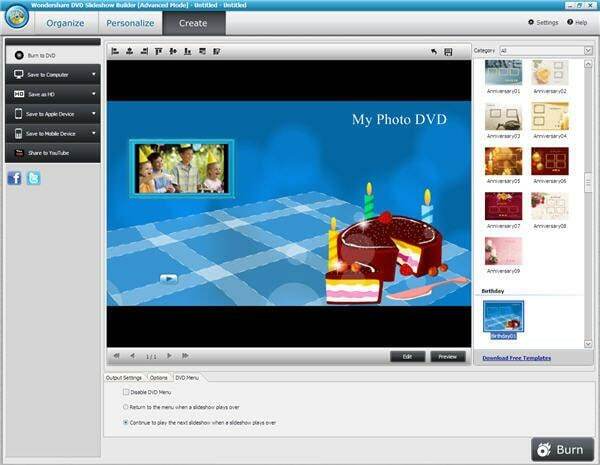 So, below is a guide on how to make a birthday slideshow with an easy-to-use birthday video maker - Wondershare DVD Slideshow Builder. First of all, launch the birthday slideshow video maker. In the Organize tab, you can import your prepared birthday photos and video clips into the software through the Add Files button. Drag & drop the wedding photos to change their orders displayed in the slideshow. And if required, you can also edit the imported photos/videos by double-clicking photo/video thumbnails on Storyboard. Creating a birthday photo slideshow with music will captivate your audience more easily. You are recommended to make a birthday photo slideshow by adding traditional birthday songs. To do so, go to Personalize tab and click Music button to select a birthday song file. By default, once you import photo/video, random transition effects would be applied automatically. However, you can change them as follows, and add motion effect if you want. The Ken-Burns (Pan/Zoom) effects bring your still image to life, and like a real movie, animated enough to get more fun from birthday photos. You could also custom your own motion to focus on special spot on the birthday photo, say the bithday cake. To do so, right click on photos and select "Customize Motion". If you want to burn your birthday slideshow onto DVD, SVCD, VCD Disc, then it is necessary to configure a personalized menu. After switching to Create tab, you could find DVD menu templates on the right. For birthday DVD menu template, go to Occasion -> birthday in the Category list. You need to download desired menu template before using it. 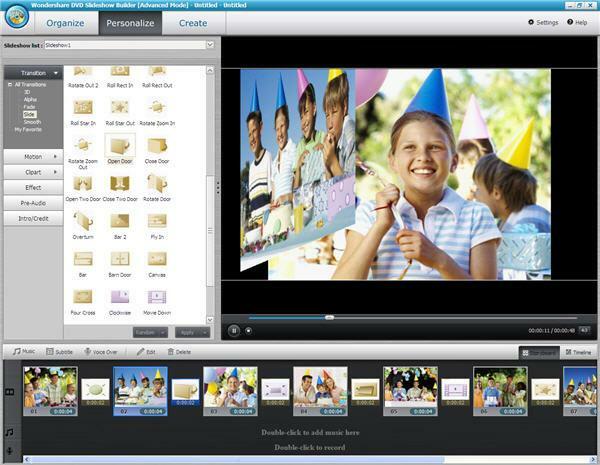 It's time now to create your birthday slideshow video in various formats. You may save it on DVD disc and send it to your friends directly. 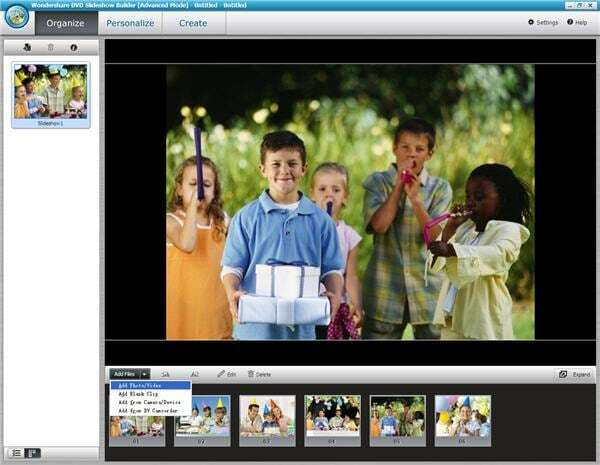 It's so easy, why not start to make a birthday video slideshow with Wondershare DVD Slideshow Builder now! Below is the birthday video slideshow sample shared on YouTube. Check it out.